By their very nature, lucky streaks don’t last. The key to long-term success is preventing a purple patch from deteriorating into a rough one. The 28-18-5 Montreal Canadiens (3rd in the Atlantic Division) are currently enjoying a 6-2-0 run fueled by a 104.5 PDO. While that mark will certainly fall, they shouldn’t tumble down the standings because they’ve built a strong defensive foundation to lean on when their good fortune runs out. Star goaltender Carey Price has long been viewed as the be-all and end-all in Montreal, so many will single him out as the team’s steadying force. Despite a stellar month (1.52 GAA, 95.3 SV% in January), however, he’s been rather inconsistent in 2018-19. The true catalyst for this stinginess is captain Shea Weber. Since his return from injury on Nov. 27, the Habs are 17-10-0. They were 11-8-5 without him. With the 33-year-old in the lineup, their goals-per-game average has dipped from 3.17 to 2.89, but they’ve vastly improved on defense (2.52 GAA vs. 3.37 GAA) and in possession (55.1 CF% vs. 51.8 CF%). Better still, they’ve accomplished this while riding a much more sustainable 101.4 PDO. In other words, these are the real Canadiens. They’re entirely capable of performing to this standard down the home stretch and beyond. On the season, the Habs are controlling 53.7% of the shot attempts (4th) and 52.9% of the scoring chances (6th) at 5-on-5. Their results have lined up with their play, too, as they own 53.8% of the goals scored (6th). That’s a great sign moving forward and a testament to Claude Julien’s efforts behind the bench. For the first time in years, Montreal is working as a well-oiled machine. Its new speed-based identity is paying dividends, as the Habs continually suffocate their opponents’ space in the neutral zone and swiftly look to counterattack. Though Weber isn’t a burner by any means, he facilitates the team’s blistering pace by minimizing its time spent in the defensive zone. With his 6’4”, 229-pound frame, the grizzled blueliner brings an element of nastiness to the back end. He may not dole out devastating open-ice hits, but he doesn’t need to. How often do those occur anyway? Once every few games at most. Instead, Weber offers consistent, dominant pushback in the trenches. He’s simply very effective at leaning on the opposition and breaking up its cycle on the strength of, well, his strength — his stick work and hockey sense also come in handy. By smothering the other team’s forwards and quickly transitioning up the ice with a simple, risk-free pass, the veteran allows the Habs to impose their desired tempo on the game. The ability to play at your pace is often overlooked, but on a club that isn’t exactly overflowing with superstars, it’s crucial. Weber regularly wins the one-on-one battles that ultimately win you the war. Among the 176 blueliners with at least 400 even-strength minutes played this year, Weber ranks 22nd in CF% and 14th in SCF%. Most importantly when it comes to defensemen, he ranks first in GF%. Those sparkling numbers reflect the value of his grunt work. In the modern NHL, rugged blueliners who can keep tight gaps, blow up a cycle and clear the crease are seldom celebrated, but Weber deserves ample praise for his performance this year. When he’s on the ice, his team presents a united front that is awfully difficult to unlock. Upon his arrival in Montreal following a blockbuster trade involving fan favorite P.K. Subban in 2016-17, he didn’t seem comfortable. Sure, he was still racking up points on the power play (22) and defending well, but he was seemingly lacking assertiveness. He didn’t put his stamp on the blue line. Perhaps he didn’t feel as though he could just step in and command the troops right away as a newcomer. While his production on the man advantage isn’t quite there yet in 2018-19 (2 points), he’s making a huge impact in all other phases of the game because he appears fully confident in his role. He has 16 points in 27 contests and the fourth-highest individual points percentage among defensemen with 400-plus minutes. Among his own club’s rearguards, he’s tied with Jeff Petry for the most rebounds created…and the latter has made roughly twice as many appearances. It’s not all about that fabled slapper either. Weber has a knack for reading opposing defenses and filtering his shots through traffic with a quick wrister if necessary. Avoiding the first wave of defenders gets net-front pests Brendan Gallagher and Andrew Shaw into the game, which adds a touch of sandpaper to complement the finesse up front. Regardless of the situation, Weber makes life miserable for the other team by forcing them to earn every inch of ice. His stout defense and terrifying point shot are wonderful assets, but on this particular club, his never-back-down attitude is priceless. The Habs haven’t held their own physically in ages, but with the knowledge that Weber has their back, they’re more willing to stand their ground and stand up for their teammates. That goes a long way psychologically. Weber has become a galvanizing presence in Montreal. If games aren’t progressing as planned, the team isn’t folding over like a cheap tent. It believes in Julien’s system and can now grind out hard-fought affairs, leaping from 26th to sixth in one-goal games this season. Considering the slim margin of victory in the NHL, this improvement under trying circumstances makes all the difference. 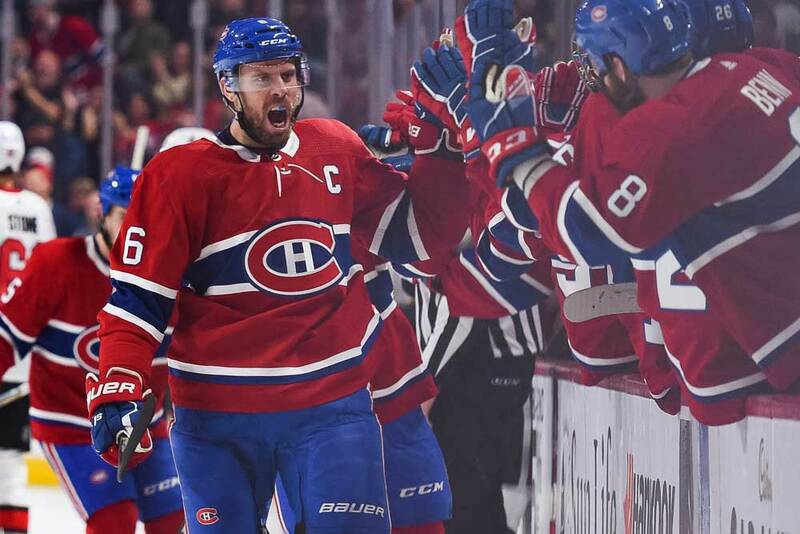 Even though he seems like a stylistic outlier, Weber is the Canadiens’ bedrock. With his wealth of experience and poise, he won’t wilt in the face of adversity. And make no mistake: Every club faces adversity. NHL seasons are long and winding roads, and staying on the right track requires the ability to manage their peaks and valleys. Max Domi and Jonathan Drouin have slowed down. Jeff Petry and rookie Jesperi Kotkaniemi are struggling with consistency. Price has had a rollercoaster campaign of his own. As the team’s elder statesman, Weber won’t get too high or too low. He can see the forest for the trees and thus has his eyes fixed strictly on the prize. The Habs have rallied around their leader and adopted his laser focus. Where they once looked afraid of a tussle, they now follow him straight into the heat of battle because they’ve reaped the rewards. Montreal finally seems ready to take on all comers — including puck luck.